The butterfly, emerging transformed from the cocoon, is an inspiring sign of hope and change, a spirit free and soaring. 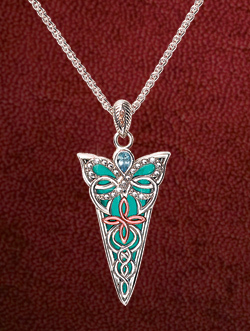 A sparkling butterfly form emerges in this pendant, silver swirls celebrating its freedom, rose gold highlights shining like the morning sun, all against a teal enamel background, topped with a blue topaz. Sterling silver, 10k rose gold and cubic zirconia. On 18" chain. Designed by Keith Jack.